Product information "Twin Tuner TV Card expansion module DVB-C/C2/T/T2 ISDB-T - DD DuoFlex C/C2/T/T2/ISDB-T expansion (V3)"
HD / UHD twin tuner TV card for DVB-C / C2 - DVB-T / T2 - ISDB-T / SBDTV-D for Octopus and Cine series. Ideal for the construction of multimedia PCs and media center systems in home as well as streaming and recording server for data analysis in the professional field. The DuoFlex C2 / T2 / ISDB-T is equipped to receive stations which via Terrestrial (DVB-T and DVB-T2 transponder) and cable (DVB-C and DVB-C2 transponder) are common. Also the reception of ISDB-T is given by ARIB STD-B31 standard. The DuoFlex used for displaying, recording and analysis of MPEG2 (SD / HD H.262) MPEG4 (SD / HD H.264) and HEVC (HD / UHD H.265) signals. The DuoFlex C2 / T2 / ISDB-T is equipped with 2 full tuners (twin tuner technology). So you have the possibility to receive two different transponders at the same time. Use this feature to receive two different cable or terrestrial transponders (frequencies) by DVB-C/T or ISDB-T simultaneously, for example to record a channel and watch another one. Each tuner works independently, so are all data from the transponders available. Over the OnBoard Located Expansion Port, the card can at any time connected to devices of the Cine or Octopus series. So you can for example, the DuoFlex Twin Tuner expansion modules use to expand an existing card to raise up to 8 tuners, by using only one PCI Express slot. Like all Digital Devices products also DuoFlex C2 / T2 / ISDB-T has a single cable system. The tuners are supplied internally via the connection over single cable. Over the separate output more TV modules of any series can be connected. There are no special drivers for this under Linux or Windows required. By using ceramic capacitors and high-quality components the DuoFlex ensures a long life even in 24/7 server operation. Drivers are available for Windows operating systems, Windows Server and Linux for download. This product was developed and produced in Germany and subject strict controls in the area of quality and environment protection and is free from environmentally hazardous substances, like electrolyte or tantalum capacitor. 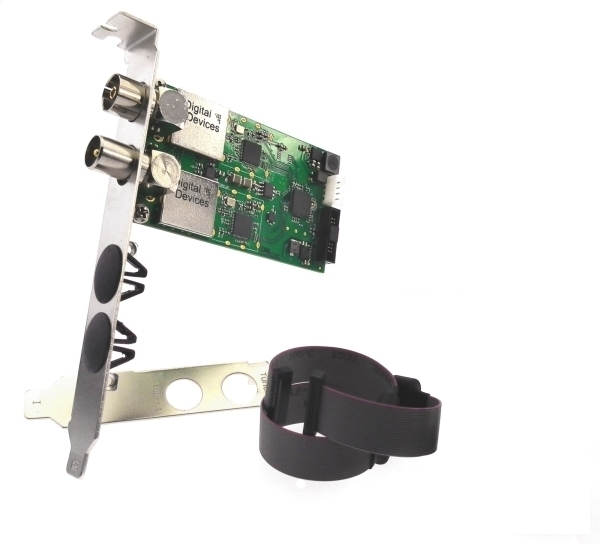 Related links to "Twin Tuner TV Card expansion module DVB-C/C2/T/T2 ISDB-T - DD DuoFlex C/C2/T/T2/ISDB-T expansion (V3)"
Q: Kann ich die Karte auch zusammen mit einem CI nutzen ? A: Ja, die Karte kann direkt über eine Erweiterungsschnittstelle eines Octopus CIs verbunden werden oder auch an vorhandenen System welche bereits ein CI besitzen genutzt werden. Q: Kann ich mit der Karte auch UHD Sender empfangen ? A: Ja, der Empfang von UHD Sendern ist über die angegebenen Empfangsarten möglich. Für die Darstellung von UHD Material ist eine entsprechende Grafikhardware und ein HEVC Decoder erforderlich. Q: Brauche ich einen speziellen Splitter um die Karte mit einem Signal zu versorgen ? A: Nein, die Karte besitzt zwei Schnittstellen. Eine ist ein Eingang (weiblich) der andere ein Ausgang (männlich). Beide Tuner werden über eine Leitung direkt mit dem Eingang versorgt. Am Ausgang kann das Signal aufbereitet wieder abgegriffen werden, damit dieses zu weiteren TV Karte durch geschliffen wird. Der Ausgang der Karten ist jedoch nur aktiv, wenn die TV Karte mit Strom versorgt wird. Q: Benötigt die Karte eine zusätzliche Stromversorgung? A: Ja, alle Erweiterungsmodule brauchen zwingend eine Stromversorgung. Die Karte besitzt zu diesem Zweck einen Molex Stecker aus der Sherlock Serie. Ein entsprechender Adapter von diesem Anschluss auf 5,25" Molex (Alter Festplattenstecker) ist im Lieferumfang enthalten. Es besteht ebenfalls die Möglichkeit die Erweiterungskarte an einen Stromanschluss der Cine oder Octopus Serie anzuschließen, falls ein solcher zur Verfügung steht (Modell abhängig). Anschlusskabel für diesen Zweck sind nicht im Lieferumfang enthalten, können aber als Zubehör bestellt werden. Q: Funktioniert das Erweiterungsmodul auch an älteren Generation der Cine oder Octopus Serie? A: Das Erweiterungsmodul kann an allen Karten der Octopus Serie betrieben werden, ebenfalls an Karten der Cine Serie ab V6.0 oder höher. Für ältere Karten der Cine oder Bridge Serie, erfragen Sie bitte die Kompatibilität. Q: In welchem Format nimmt die Karte auf? A: Die Karte stellt lediglich die Daten bereit, welche von der Software verarbeitet werden. Das verwendete Aufnahmeformat liegt bei der jeweiligen Anwendung. Q: Ist der Empfang von z.B. DVB-C und DVB-T gleichzeitig möglich? A: Normalerweise nicht, da nur eine Zuleitung an der Karte angeschlossen wird. Das DVB-C und DVB-T Signal verwenden das gleiche Frequenzband und würden sich daher gegenseitig stören. Ausnahme ist, wenn sich im Versorgungsgebiet die DVB-C und DVB-T Frequenzen nicht die gleiche Frequenzbelegung teilen, die beiden Signalarten über einen speziellen Combiner zusammengeführt werden können. Dies ist allerdings sehr selten. Q: Ist mit der Karte Radioempfang möglich? Q: Can I use the card together with a CI Slot? Yes, the card can directly connect to an expansion slot of an Octopus CIs or to an existing system which are already have a CI in use. Q: Can I receive with the card also UHD channels? Q: Do I need a special splitter to supply the card with a signal? A: No, the card has two interfaces. One is an input (female) and the other an output (male). Both tuners are supplied over one line directly to the input. At the output, a signal can be picked up to loop this to another TV card. The output of the card is only active when the TV card is supplied with power. Q: Requires the card an additional power supply? A: Yes, all expansion modules need compelling a power supply. The card has for this purpose a Molex plug from the Sherlock series. A corresponding adapter from this connector to 5.25 "Molex (Old HDD connector) is included. There is also the option to connect the expansion card to the power connector of the Cine or Octopus series, if one is available (model dependent). connecting cable for this purpose are not included but can be ordered as accessories. Q: Works the expansion module also to older generation of cine or Octopus series? A: The expansion module can be used with all cards of Octopus series, also to cards the Cine series V6.0 or higher. For older cards of Cine or Bridge series, please contact us for compatibility. Q: In format the card records? A: The card provides only the data from the stations which are processed by a software. The recording format is depended by used the application. Q: Is the reception of e.g. DVB-C and DVB-T at the same time possible? A: Normally not, because only one line is connected to the card. The DVB-C and DVB-T signal using the same frequency band and would therefore interfere with each other. Exception is, if the DVB-C and DVB-T frequencies do not share the same range in the coverage area, then both signal types can be combined with a special combiner. But this is very rare. Q: Is it possible to receive radio stations with the card?